^ Is Mars habitable? A critical examination of Professor Percival Lowell's book "Mars and its canals. ", an alternative explanation, by Alfred Russel Wallace, F.R.S., etc. London, Macmillan and co., 1907. ^ KLEIN, HAROLD P.; GILBERT V. LEVIN (1976 - 10 - 01). “The Viking Biological Investigation: Preliminary Results”. Science Vol. 194. (no. 4260): 99–105. doi:10.1126/science.194.4260.99. http://www.sciencemag.org/cgi/content/abstract/194/4260/99 2008年8月15日閲覧。. ^ Hecht, Michael H.; Ashwin R. Vasavada (2006 - 12 -14). “Transient liquid water near an artificial heat source on Mars” (PDF). Mars, the International Journal of Mars Science and Exploration 2: 83–96. ^ a b c Paepe, Ronald (2007). “The Red Soil on Mars as a proof for water and vegetation” (PDP). Geophysical Research Abstracts Vol. 9 (01794). http://www.cosis.net/abstracts/EGU2007/01794/EGU2007-J-01794.pdf?PHPSESSID=e 2008年8月14日閲覧。. ^ a b Navarro-González, R.; et al. (2006). “The limitations on organic detection in Mars-like soils by thermal volatilization-gas chromato-graphy-MS and their implications for the Viking results”. Proceedings of the National Academy of Sciences 103 (44): 16089–16094. doi:10.1073/pnas.0604210103. ^ Crocco, Mario (2007 - 04 -14). “Los taxones mayores de la vida orgánica y la nomenclatura de la vida en Marte:”. Electroneurobiología 15 ((2)): 1–34. http://electroneubio.secyt.gov.ar/First_biological_classification_Martian_organism.htm 2008年8月14日閲覧。. ^ a b c d e Evidence for ancient Martian life. E. K. Gibson Jr., F. Westall, D. S. McKay, K. Thomas-Keprta, S. Wentworth, and C. S. Romanek, Mail Code SN2, NASA Johnson Space Center, Houston TX 77058, USA. ^ McKay, D.S., Gibson, E.K., ThomasKeprta, K.L., Vali, H., Romanek, C.S., Clemett, S.J., Chillier, X.D.F., Maechling, C.R., Zare, R.N. (1996). “Search for Past Life on Mars: Possible Relic Biogenic Activity in Martian Meteorite ALH84001”. Science 273: 924–930. doi:10.1126/science.273.5277.924. PMID 8688069. ^ Malin, Michael C., Edgett, Kenneth S., "Evidence for Recent Groundwater Seepage and Surface Runoff on Mars".Science (2000) Vol. 288. no. 5475, pp. 2330–2335. ^ "University of Arizona Press Release" March 16, 2006. ^ Opportunity Rover Finds Strong Evidence Meridiani Planum Was Wet" - March 2, 2004, NASA Press release. URL accessed March 19, 2006. ^ Kerr, Richard (2006 - 12 - 8). “Mars Orbiter's Swan Song: The Red Planet Is A-Changin'”. Science 314 (5805): 1528–1529. doi:10.1126/science.314.5805.1528. http://www.sciencemag.org/cgi/content/summary/314/5805/1528 2008年8月13日閲覧。. ^ Tosca, N. J. (2008). “Water Activity and the Challenge for Life on Early Mars”. Science 320 (5880): 1204–1207. doi:10.1126/science.1155432. ^ Mumma, M. J.; Novak, R. E.; DiSanti, M. A.; Bonev, B. P., "A Sensitive Search for Methane on Mars" (abstract only). American Astronomical Society, DPS meeting #35, #14.18. ^ V. Formisano, S. Atreya T. Encrenaz, N. Ignatiev, M. Giuranna (2004). “Detection of Methane in the Atmosphere of Mars”. Science 306 (5702): 1758–1761. doi:10.1126/science.1101732. ^ V. A. Krasnopolskya, J. P. Maillard, T. C. Owen (2004). “Detection of methane in the martian atmosphere: evidence for life?”. Icarus 172 (2): 537–547. doi:10.1016/j.icarus.2004.07.004. ^ Moran, M., et al., “Desert methane: implications for life detection on Mars, Icarus, 178, 277-280, 2005. ^ Vladimir A. Krasnopolsky (February 2005). “Some problems related to the origin of methane on Mars”. Icarus Volume 180 (Issue 2): 359–367. doi:10.1016/j.icarus.2005.10.015. http://www.sciencedirect.com/science?_ob=ArticleURL&_udi=B6WGF-4HTCW36-2&_user=10&_rdoc=1&_fmt=&_orig=search&_sort=d&view=c&_acct=C000050221&_version=1&_urlVersion=0&_userid=10&md5=a614a9e35a422b94cc2611ccdc4bf180. ^ Peplow, Mark (Published online February 25, 2005). “Formaldehyde has been found in the Martian atmosphere”. Nature - News. doi:10.1038/news050221-15. http://www.nature.com/news/2005/050221/full/news050221-15.html 2008年8月18日閲覧。. 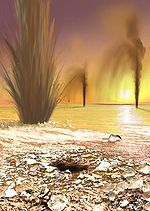 ^ "Martian methane probe in trouble" - September 25, 2005 http://www.nature.com news story. URL accessed March 19, 2006. ^ Kieffer, Hugh H.; Philip R. Christensen and Timothy N. Titus (30 May 2006). “CO2 jets formed by sublimation beneath translucent slab ice in Mars' seasonal south polar ice cap”. Nature 442: 793-796. doi:10.1038/nature04945. http://www.nature.com/nature/journal/v442/n7104/abs/nature04945.html 2009年9月2日閲覧。. ^ Gánti, Tibor; András Horváth, Szaniszló Bérczi, Albert Gesztesi and Eörs Szathmáry (March 12-16, 2001). “Probable Evidences of Recent Biological Activity on Mars: Appearance and Growing of Dark Dune Spots in the South Polar Region” (PDF). 32nd Annual Lunar and Planetary Science Conference, Houston, Texas, abstract no.1543. http://www.lpi.usra.edu/meetings/lpsc2001/pdf/1543.pdf 2008年11月20日閲覧。. ^ Gánti, Tibor; András Horváth, Szaniszló Bérczi, Albert Gesztesi and Eörs Szathmáry (October 31, 2003). 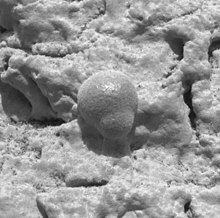 “Dark Dune Spots: Possible Biomarkers on Mars?”. Origins of Life and Evolution of Biospheres Volume 33 (Numbers 4-5): 515–557. doi:10.1023/A:1025705828948. http://www.springerlink.com/content/ut8r78131173254n/ 2008年11月18日閲覧。. ^ Orme, Greg M.; Peter K. Ness (9 June 2003). “MARSBUGS”. The Electronic Astrobiology Newsletter 10 (23): 5. http://www.lyon.edu/projects/marsbugs/2003/20030609.pdf 2009年9月6日閲覧。. ^ Manrubia, S. C.; O. Prieto Ballesteros1, C. González Kessler1, D. Fernández Remolar1, C. Córdoba-Jabonero1, F. Selsis1, S. Bérczi, T.Gánti, A. Horváth, A. Sik, and E. Szathmáry (2004). “COMPARATIVE ANALYSIS OF GEOLOGICAL FEATURES AND SEASONAL PROCESSES IN INCA CITY AND PITYUSA PATERA REGIONS OF MARS”. European Space Agency Publications (ESA SP): pp. 545. http://www.colbud.hu/esa/publications/29ProcCAB-3ESASP-545pp77-80.pdf 2009年9月7日閲覧。. ^ a b Ness, Peter K.; Greg M. Orme (2002). “Spider-Ravine Models and Plant-like Features on Mars - Possible Geophysical and Biogeophysical Modes of Origin”. Journal of the British Interplanetary Society (JBIS) 55: pp.85-108. http://spsr.utsi.edu/articles/ness.pdf 2009年9月3日閲覧。. ^ a b Dartnell, L.R. et al., “Modelling the surface and subsurface Martian radiation environment: Implications for astrobiology,” Geophysical Research Letters 34, L02207, doi:10,1029/2006GL027494, 2007.